Students, parents and teachers will know in coming days exactly how much the government’s new funding plan will benefit their schools. However, Prime Minister Malcolm Turnbull faces a battle with states, federal Labor and the Catholic schools sector to secure his plan, dubbed ‘Gonski 2.0’ after being endorsed by the architect of needs-based funding, David Gonski. 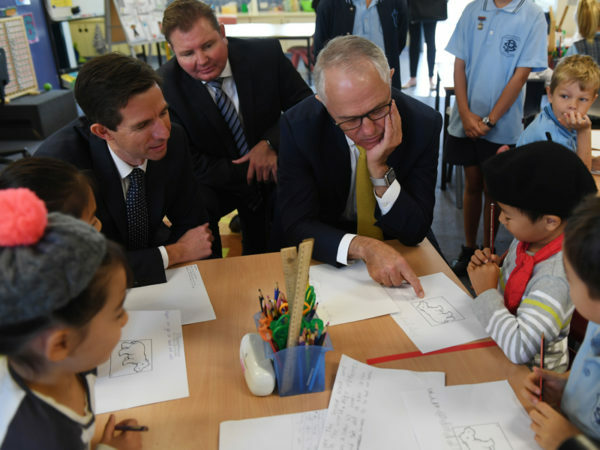 Visiting a Sydney school on Wednesday with Mr Turnbull, Education Minister Simon Birmingham said the government would release a funding calculator in coming days. “That will enable anybody, a parent, a school leader or others to go online and take a look at what our funding model means for each and every school,” Senator Birmingham said. Under the new deal, federal funding will grow from $17.5 billion in 2017 to $22.1 billion by 2021, and $30.6 billion by 2027. Twenty-seven different school funding agreements entered into by the former Labor government would be replaced with a single, national, sector-blind, needs-based funding model for government and non-government schools. Mr Gonski, who led the landmark 2011 review, has agreed to head a new review into improving student outcomes. As the plan is rolled out across the country’s 9400 schools, about 24 wealthy private and church-run schools will have their funding cut, while another 350 would experience lower rates of funding growth. Labor leader Bill Shorten said the “snake oil” package represented a $22 billion cut over 10 years compared with what his party had proposed under the original Gonski scheme. “You can’t trust the Liberals and, indeed, the Catholic education sector has been in touch with us and they are very concerned that the Catholic education system is being specifically targeted by Malcolm Turnbull’s cuts to school funding,” Mr Shorten said. Senator Birmingham said the Catholic sector would receive $1.2 billion in growth funding over the next four years or 3.7 per cent for each student, but he was open to discussing the matter with Catholic representatives. NSW Premier Gladys Berejiklian, whose state was the first to sign up to the original Gonski funding deal with then prime minister Julia Gillard in 2013, said she expected the original agreements and funding arrangements to be delivered. “I’m heartened by the principles … where education funding will go in terms of needs basis, but I don’t want to take away for a second the fact that myself, the NSW education minister and entire government will ensure that the agreement we signed up to is delivered,” she said. Victorian education minister James Merlino said it was a betrayal. “What Malcolm Turnbull announced is a cut for every single Victorian student, a $630 million black hole,” Mr Merlino said. Catholic Education Melbourne executive director Stephen Elder said his schools would have to cut programs or raise fees in what was a “direct attack on parent choice”. Queensland education minister Kate Jones said her state would be $300 million worse off over the decade. With federal Labor opposed to the plan, the government will need the support of the Greens or crossbenchers to pass laws to cement in place the funding model. The Greens are not ruling out backing the new package. “We’re up for the hard work of fixing our education system. Our kids are being left behind and it’s time us pollies got on and fixed it for good,” the party’s education spokeswoman Sarah Hanson-Young said.